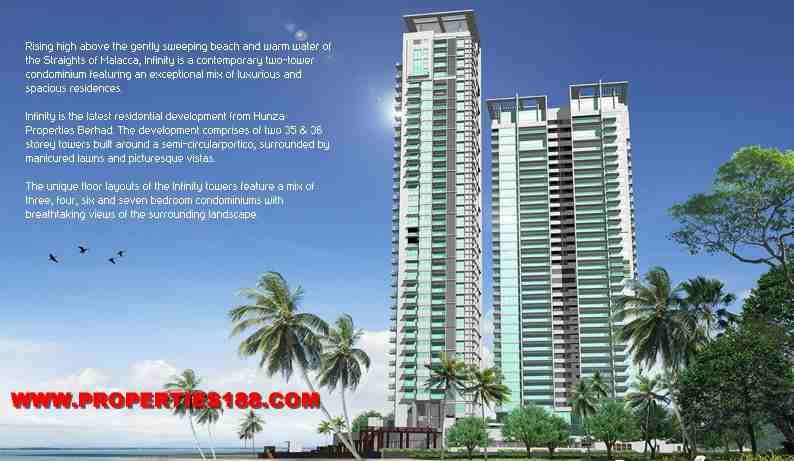 Infinity Beachfront Condominium is located at Tanjung Bunga, one of the most desirable residential neighborhoods in Penang. Infinity is a high-end residential development comprising 119 units of condominiums, penthouses and cabanas housed in two supremely elegant towers each with two condominiums per floor. Two 35 & 36 storey towers of modernist architecture, Infinity is not just about the space in the sky, but also the luxury if many facilities at hand. Condominium sizes of between 3,693 sq. ft. and 4,866 sq. ft.
Grand Entrance Lobby, Infinity Swimming Pool and Wading Pool, Concourse Lounge, Male and Female Changing Rooms, Reading Room, Pool Jacuzzi, Private Meeting Room, Barbeque Pits, Business Center, Children's Playground, Function Room, Cabanas, Gymnasium, Steam Bath, Children's Playroom, Landscaped Lawns and Water Features, Viewing Deck, Reflexology Path.